Or as many or my titles have been over the last few years. "K802 ORL returns"
Indeed the original Olympian is back at Torpoint after some 4 months away from the depot. This was after some major accident damage but she now has a new front end and is looking superb once again. Though they didn't bother with the interior! She still has the dull blue moquette where as the other 3 have the First group moquette. But it is nice to have them all back together after all these years. They've been apart since they were replaced on the X80 and were dispersed over Devon. 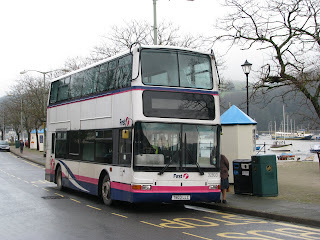 This will also have been her first new 81A, though she has done many trips to Polperro on the old 81A way back in 2005/6. K802 originally replaced LFJ 847W before the influx of the C reg Olympians. Today I took a trip with the purpose of taking photos of the outstation at Totnes for the last time, before this depot closes in the new year. The day started off with a uneventful and plesent trip down to Cremyll with Jim, across the ferry and upto town on an Enviro 200. 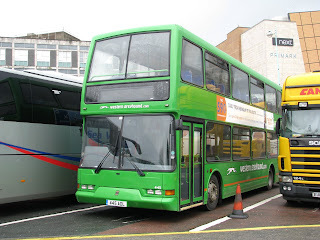 On arrival at Bretonside was my stead for 2 hours, this being T803 LLC, one of the London outcasted Tridents! These really are quite terrible for such a journey and really do struggle on some of the hills, as well as the relatively low top speed with a gearbox made for the roads of London, and not blasts through the Countryside! This was then made somewhat worse a passenger sitting fairly near me and to be honest after the leg between Modbury and Kingsbridge, I had to retreat upstairs, the smell was unbearable if I'm honest! But anyway the journey was pretty smooth though coming down to Blackpool sounds a warning buzzer alerted the driver of low water. 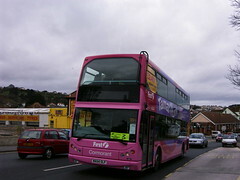 He did continue the rest of the journey without fault, though the bus was swapped round on arrival at Dartmouth. 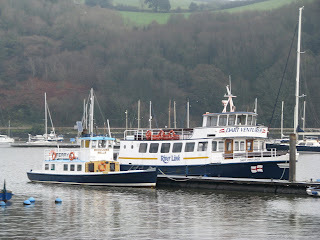 While there I took a few pictures of the various ferries that River Link own, along with Edgcumbe Belle which used to run the Cremyll Ferry in years gone by. 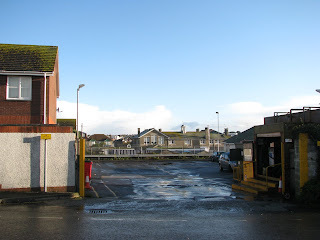 I also had a look at the remains of the original Dartmouth Depot which has now become a car park for Marks and Spencer. But to get to the current depot was up a, well, unexpectedly steep hill which took around 40 minutes to climb! 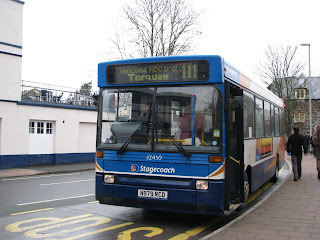 I was expecting more of a 15 minute hop but no worry I had an hour before the 111 to Totnes! 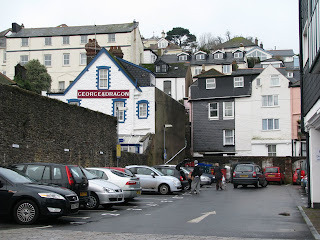 Again the journey from Dartmouth to Totnes aboard a step Dart was very plesent, and on arrival in Totnes it was across to Ticklemore Street and Victoria Place to see the remains of the original depot. Much has changed though some walls are still in place as they were when there was a depot in what is now a very quiet street! 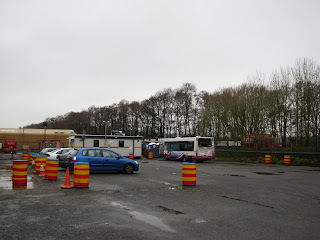 Then upto the new depot on Wills Road and really its more of an area which is marked up with some cones, than a depot! 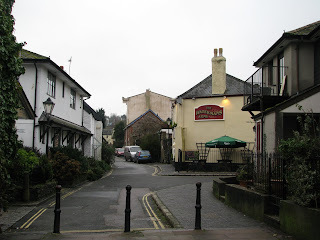 But nevertheless its still an important loss after Totnes having a depot for many years and really seeing its demise. 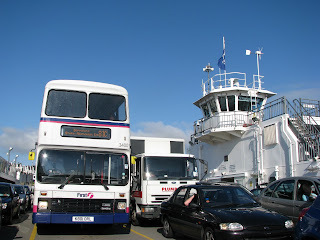 The sole Volvo B6 was standing there along with the Portacabin. 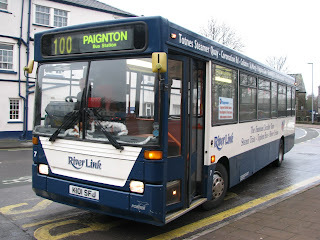 And then it was off upto Paignton on River Link's Dennis Dart K101 SFJ. 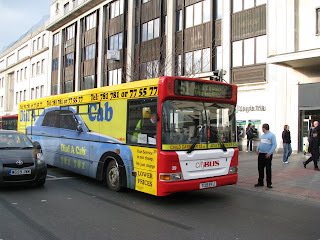 As many of you will know this is the Ex Plymouth Citybus vehicle, and I must say, she's still got it! Bus of the day for the first time has gone to a Dennis Dart, what has the world come to! But indeed the older Darts do have a certain charm about them, and with that booming cummins down the back, they are a pretty decent bus. And then it was back down to Plymouth on the X80. This was my first trip using this service and now I see why it has such a bad reputation. Of the route which is over 2 hours long, just 8 minutes of this is spent doing 'express' speeds on the A38! Whatever happened to the meaning of the X! This was not helped by the driver changeover going far from smoothly, with the relief driver turning up some 10 minutes late, and then another 5 was lost doing his signing on. 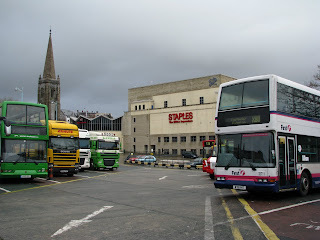 One of the worst parts of the route comes right at the end, where the bus is diverted off the main road into Plymouth past the Barbican Leisure Centre. I simply ask why in the world do you make pretty much the longest route from Plymouth, even longer by doing this? 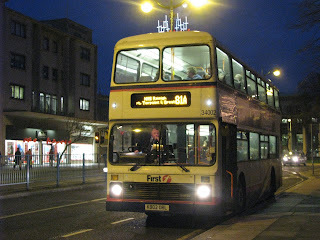 And on arrival at Plymouth I'd missed the 81C, so it was back across the river via Cremyll again. Isn't it funny the variety of things that can cause disruption to a service! 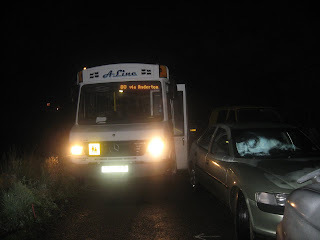 I was on Bertie on the trip back to Cawsand but while going along Anderton, around 15 cars had taken advantage of the free parking for a Christmas Party. We squeezed past most of the cars but when it came to this quite frankly, terribly parked car even the Vario couldn't get through! And this being a party fueled with drink it took around 20 minutes for a driver to appear and to move the car! 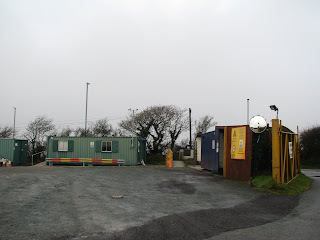 Today I took a trip down to Newquay with the purpose of taking some final pictures the Tolcarne Road depot before it closes early next year. I was hoping for a vibrent, working depot but what greeted me was simply a bit of tarmac and a fuel pump without any buses in it! So this was a bit of a wasted journey, but the trip itself was a far different story. First leg of the journey was today not with the usual Dennis Trident, but in the much more capable hands of K801 ORL with Top Torpoint Driver Tony Body. This was a nice relaxing start to the morning with K801 performing well along the cliffs. On reaching Antony I disembarked and unfortunately had a pretty cold wait for the 581 bound for Liskeard! Western Greyhound Mercedes Vario WK56 SET greeted me with heaters a blaze. This was a very plesent trip towards Liskeard, the gritting lorry had just been along the road so conditions were fine for the entire length of the journey. Pictures shows her at the terminus in Liskeard with a light dusting of snow underfoot. 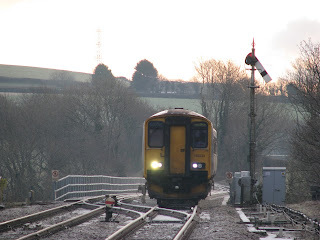 The treak down towards the platform at Liskeard was quite scary with the pathways iced over and the slope being quite steep. But pacing down slowly I made it down to Platform 1 for the 0851 to Penzance. It seemed even colder now than it was for the wait for the Vario but soon 150233 approached the station. Again the trip went perfectly down to St Austell where I disembarked and got straight on to a 527 to Newquay with another Vario. On reaching Newquay I then went upto the depot as previously said to find nothing but this view above. 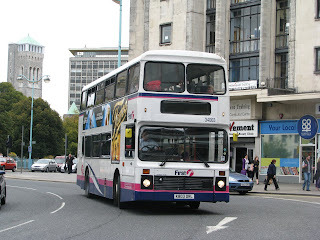 But not to worry a pasty was had and then it was off on the 90 to Truro with Ex Airbus Olympian 34196. Its quite amazing how much the batch vary in condition, but I think it safe to say that 196 was the best I've been on. A quick change at Truro to an Ex London Dennis Trident (to be honest I didn't bother taking a picture to remember what it was!) for the journey back to Newquay. Half an hour wait at Newquay then saw me board the 597 with Ex Nottingham Volvo Olympian S453 ATV for the run upto St Columb Major. 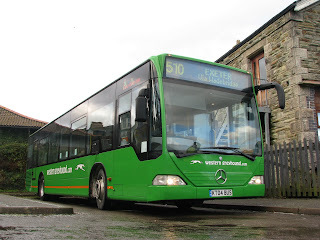 The driver was then instructed to continue the journey with KT04 BUS, the Mercedes Citaro! This was a fantastic run all the way upto Launceston. The Citaros really are such a pleasurable vehicle to ride on and I was if I'm honest surprised how well this effectively 'Citybus' coped with the terrain of the Cornish Countryside. People are still having a good look as the Citaro sweeps past, this one definitely stands out from the crowd! At Launceston it was a 20min wait for the 576 back to Plymouth though before this turned up, Group Travel's Optare Solo SR came through. This was quite a shock to see something as modern as this in the town, again a bus that definitely stands out! After this a brand new 59 reg Solo whisked me back to Plymouth. Western Greyhounds larger Solos are fitted with a Cummins engine rather than the more common Mercedes engine and I must say this really makes all the difference! The Solo absolutely flew along the road. The interior of these are also very comfortable, much better than a leather seat any day! 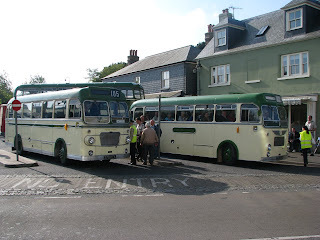 It was then a hop across the road to catch 32758 with Top Torpoint Driver Mike, back to Cawsand. All this for just £7.50! What a bargin. Its funny to think that all the vehicles in this shot (excluding the Trident) could be gone within the next year or two under Go-Ahead power. The 709s will likely be the first to be replaced under the new ownership, pretty much marking the end of the Mercedes Minibus reign. This of course excludes Target Travel's 2 709s though the rest of them have been replaced with Solos. As for the Volvos these may be retained for school work, but it wouldn't take many more newer deckers to see these go as well. Again this will see the end of this type being used in the area. FDC's closed tops have now been withdrawn, but of course there will still be many of them in the open top form working in Cornwall and from next year in Devon as well. And as for the Darts with steps again these will be replaced in the near future. I must say I do prefer the older Darts to the newer ones. That Cummins always sounds a bit more throaty in them - if you can call it that compared to a Bristol SU! Tamar Link in the Snow! Thanks to driver Jamie Limb for these pictures of one of the Tridents 'dashing through the snow' (sorry for the pun) in Torpoint today. The snow never really settled though over the course of the evening ice has formed, causing several cars to spin off the road! There has always been something magical about buses in the snow, so hopefully we'll have some more so I can go and get a few! Ahh wait the silly camera! Well as long as I don't zoom in and out I might be able to scrape in a few photos in! First have been busy with the paint brush recently, refurbishing some of the older Darts and Volvo B6s. With the introduction of the B7s the rest of the fleet has been shown up and bit, but with a bit of fresh paint on them, they're looking superb again. 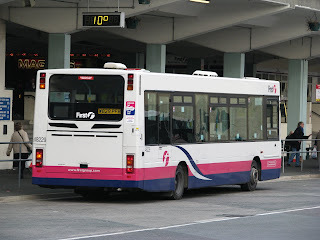 I know many people are not a fan of the Barbie 3 livery though I think the livery suits many of the modern more streamline buses, that a livery from the past would not. Here is newly re-painted Volvo B6 W829 PFB seen basking in the afternoon sun down at Bretonside before working an 83. A PCB repaint as well! 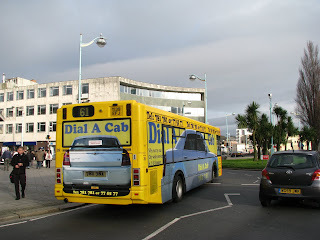 As has been mentioned on Plymothian Transit, Plymouth Citybus have yet again put a Dart into the Dial A Cab branded livery, though it looks a lot fresher and brighter than the last dark blue livery on L126 YOD. Sorry for the poor photography but I wasn't really ready for it, and that place in Royal Parade is not ideal! Also to add to misery my Canon is starting to develop a common problem with the S5 and S3 ISs this been with the lens. After researching this I've found that the error I've been getting is very common in this type of Canon after just 2 years! Mine is coming up to its 2nd birthday soon so it does all add up. Hopefully there may be a more quick fix I can do but if now then its a lengthy 3 week wait for a proper Canon repair in Germany! It may be back to the old Vivitar over Christmas! 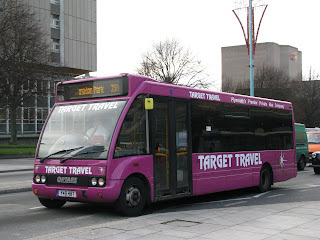 Target Travel have taken full advantage of Citybus' new position by advertising themselves as Plymouth's Premier Private Bus Company. 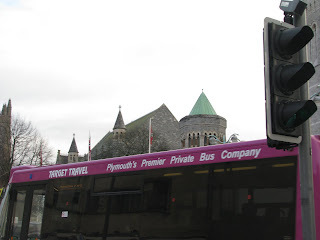 Of course TT is now the major private operator in Plymouth now Citybus is under Go Ahead management. Will be very interesting to see what happens in the future and how much damage Go Ahead will try to do to FDC. Of course PCB has a lot of area it could still expand into, though FDC have pretty much covered all the core areas of Plymouth, but only time will tell! Well I haven't done a snap on Sunday for quite a while now but here we go re-starting again with this shot of Brittany Ferries' Bretagne seen leaving Plymouth. 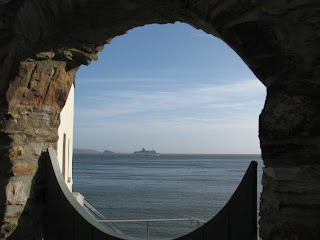 The photo was taken from Cawsand. Here seen yesterday on a light working is Colas Rail's 47749 passing through Exeter St Davids heading up from Plymouth. As you will see there is plenty of clag on exit from the station. Shame I was standing the opposite end!! Goodbye...and thanks for all the toots! Thats it. 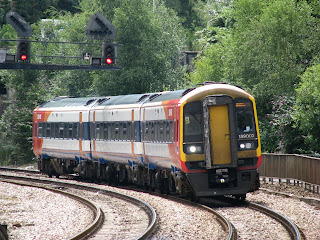 The end of South West Trains, running south of Exeter. And fair well to the link between Plymouth and London Waterloo as well. Today saw the last ever running of South West trains, south of Exeter, all trains will now only go as far as Exeter and then terminate. A massive thanks to the train crew on-board this evening, it was quite a fantastic spectacle so thanks for making that bit of effort for the final running after nearly 17 years! I will leave the video to show you the day. This weekend will see the last day of South West Trains services running south of Exeter. Routes have run from Penzance/Plymouth/Paignton to London Waterloo since BR days, where you would always come across the Class 50s playing their trade. Something I'd love to see nowadays. But back to the point South West Trains took over the running after Network South East lost this franchise. Class 159s have been running them for a while now and though they may not have the character and charm of older DMUs, or mighty Locos the 159s have always offered fantastic passenger comfort and reliability. They are always a pleasure to ride on and I shall sorely miss the infrequent trips I have on the type. So cameras at the ready for the final passings of SWT. Western National Bristol SU, 270 KTA, fleet number 420 has passed into the capable hands of David Sheppard, of BBC Local Radio. He has mentioned to me he'd always wanted to own a pair of something and now this has come true with the two SUs matching near perfectly. 270 KTA was sold due to funding problems within the WNPG. Sadly this is effecting the preservation circle, just as it is effecting real operators and WNPG has had to cut back on its fleet to save and make money at the same time. 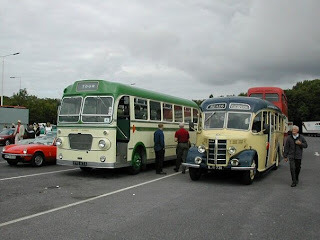 Good luck to Dave in the future preservation of the bus! It is great to have the sisters re-united! Well I am quite a virgin to Twitter but reading Plymothian Transit's blog on this today has made me that bit more interested! Slight observation I've made though. One the First Devon and Cornwall Twitter page it has a selection of 'followers'. 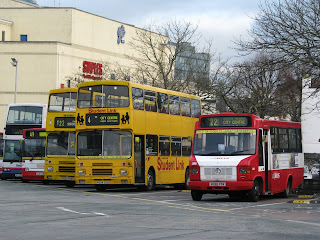 One of these is Plymouth Citybus. 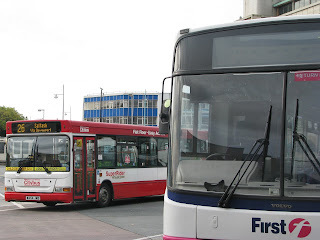 So therefore Plymouth Citybus is following FDC. Just thought that was quite ironic but I'll leave that one for you to ponder over! 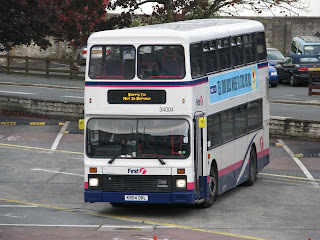 As I've mentioned before I always like to keep an eye on the 34 when it passes me each morning on its way to Derriford. 34 seems to have been directly effected by the takeover from Go-Ahead and a multitude of buses have turned up on the route over the past 2 weeks. Before, as it should be, there was an Enviro 200 working the 34, in the route branded livery. Though most of last week saw some of the X reg Mini Darts run the 34 at this time. There has also been several of the older full size Darts, mainly the R reg batch. 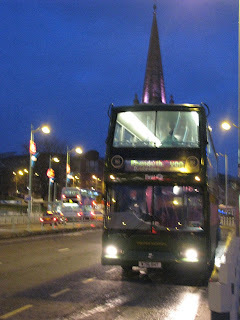 There was also one sighting of L116 YOD on the 34 last week. And today's working saw N104 UTT operating it. I'm not complaining though! Having a bit of variety is by no means a bad thing! 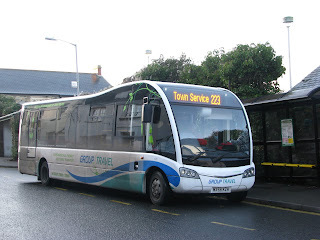 Well yes very old news but I have just stumbled across this fantastic photo from Jeff Day of 32757 operating a RAIL REPLACEMENT service in Paignton! 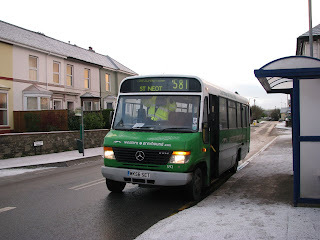 The bus was being used when the branch line between Newton Abbot and Paignton was closed and therefore when brand new in 2005, WA54 OLP traveled up to cover for the trains between the towns. I think this must be about the furthest she's been from home, considering the Tridents arn't really supposed to be used on any other services apart from the 81s! Right well here we go! Apologies from me to start off with. Over the last couple of weeks we've been having some mock GCSEs, and yes they don't count for anything but effort still has to be made to ensure we get entered into the 'Higher Tier' exams come June time in 2010! But enough of that lets concentrate on the important things in life. 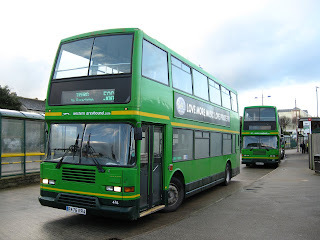 Seen on Saturday in Bretonside bus station was Western Greyhound's 445 ADL, a Dennis Trident with Lolyne bodywork. I presume she'd come off the 576 from Bude. 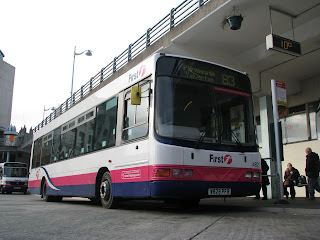 My first sighting of a WG decker in Plymouth so I was quite excited! She is also picture here with near identical W711 RHT awaiting a turn on the X80. Hello. 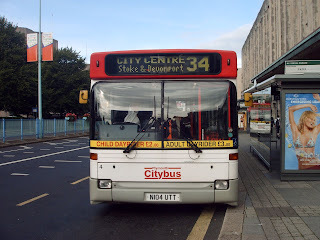 I am a young transport enthusiast from the Plymouth area here to give you all the goings on of public transport in and around Plymouth - with occasional blogs on other sectors.